Our technicians just installed this A.O. Smith ProLine replacement tank. The customers original tank carried a 10 year warranty. The leak occurred after 9 years. 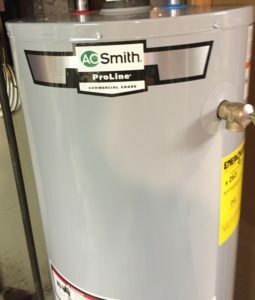 The customer was provided with a brand new tank and will be happily making hot water for many years to come. We received the call on Monday morning and our plumber had the job complete in a matter of a few hours. Because we primarily use A.O Smith products exclusively our warranty process is always seamless. Unlike the “big box” stores where it can be a very cumbersome process. Please call our office in Framingham to discuss all of your hot water options. Joe Kaufman Plumbing 508-875-2593. We are committed to superior service.